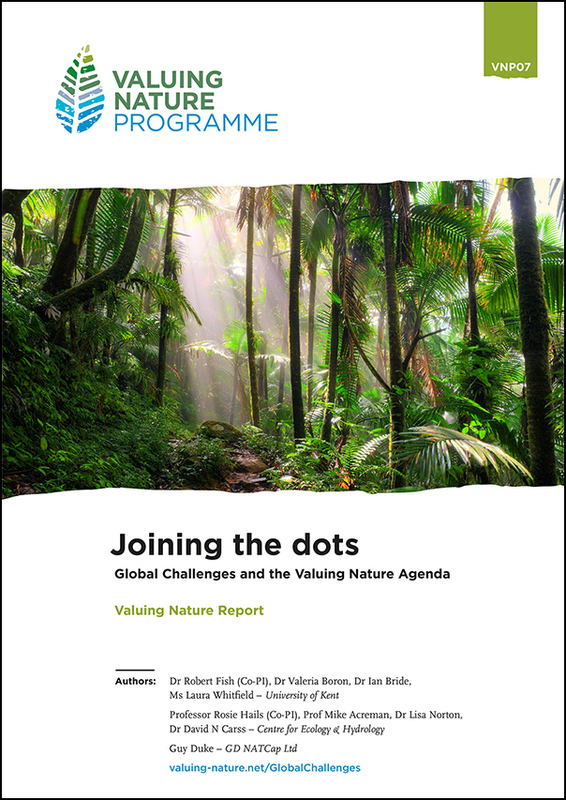 This new report Joining the Dots: Global Challenges and the Valuing Nature Agenda from the Valuing Nature Programme provides a review of published research which elaborates synergies between the Valuing Nature Network and Global Challenges Research agendas. The report was written by a multidisciplinary team led by Valuing Nature’s Rob Fish (University of Kent) and Professor Rosie Hails (National Trust). Professor Rosie Hails, Head of Programme Coordination Team said "The natural world underpins economic and social prosperity, but is often undervalued and so over exploited. The developing multi-disciplinary research agenda ‘Valuing Nature’ aims to advance our understanding of the economic and social benefits we derive from the environment. This report explores how different parts of this research agenda are developing in the scholarship of different countries, reflecting how environmental context influences perspective. This should provide a valuable academic resource for the future." Establish key opportunities for advancing the global challenges research with respect to valuing nature scholarship. A comprehensive literature search was conducted through the Web of Science database, using a range of search terms pertaining to valuing nature concepts and mechanisms. Abstracts were grouped and analysed around a ten predetermined thematic areas including trends in scholarship that link the Valuing Nature Network and Global Challenges Research agendas. The review describes the Research undertaken, key findings and an overview of research Capacity (networks & funding).